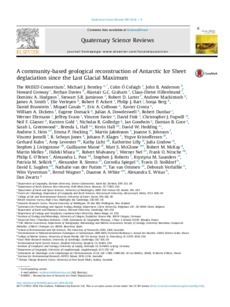 A robust understanding of Antarctic Ice Sheet deglacial history since the Last Glacial Maximum is important in order to constrain ice sheet and glacial-isostatic adjustment models, and to explore the forcing mechanisms responsible for ice sheet retreat. Such understanding can be derived from a broad range of geological and glaciological datasets and recent decades have seen an upsurge in such data gathering around the continent and Sub-Antarctic islands. Here, we report a new synthesis of those datasets, based on an accompanying series of reviews of the geological data, organised by sector. We present a series of timeslice maps for 20 ka, 15 ka, 10 ka and 5 ka, including grounding line position and ice sheet thickness changes, along with a clear assessment of levels of confidence. The reconstruction shows that the Antarctic Ice sheet did not everywhere reach the continental shelf edge at its maximum, that initial retreat was asynchronous, and that the spatial pattern of deglaciation was highly variable, particularly on the inner shelf. The deglacial reconstruction is consistent with a moderate overall excess ice volume and with a relatively small Antarctic contribution to meltwater pulse 1a. We discuss key areas of uncertainty both around the continent and by time interval, and we highlight potential priorities for future work. The synthesis is intended to be a resource for the modelling and glacial geological community.